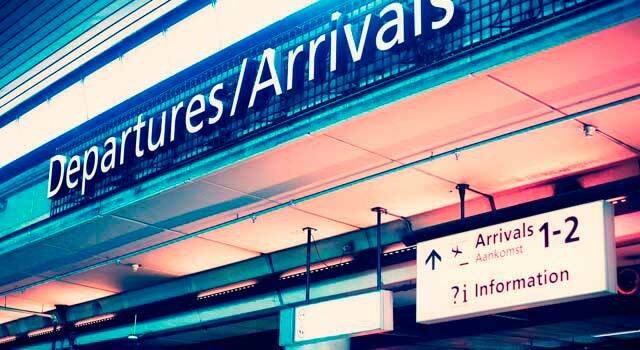 Welcome to Amsterdam Airport: Here you can find information about flights (departures, arrivals), parking, transport, hotels, maps and car rental in Schiphol, Amsterdam's Airport. Check Amsterdam Travel Guide at Bautrip for more information about Amsterdam. Schiphol Airport, also called Amsterdam Airport (IATA: AMS, ICAO: EHAM), is the main airport in the Netherlands. It is one of the busiest airports in the world in terms of passenger traffic. 68.5 million passengers passed through Amsterdam airport in 2017. Amsterdam Airport operates Low Cost companies and international flights: Asia, Canada and USA. Amsterdam Airport is built as one large terminal, split into three large sections. 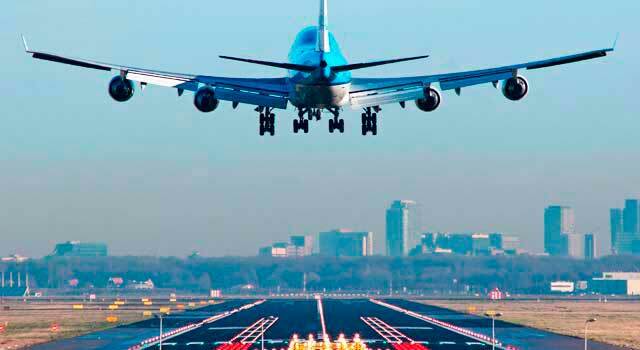 Schiphol Airport has 6 runways. Enjoy your holidays in the Netherlands flying to Amsterdam Airport. 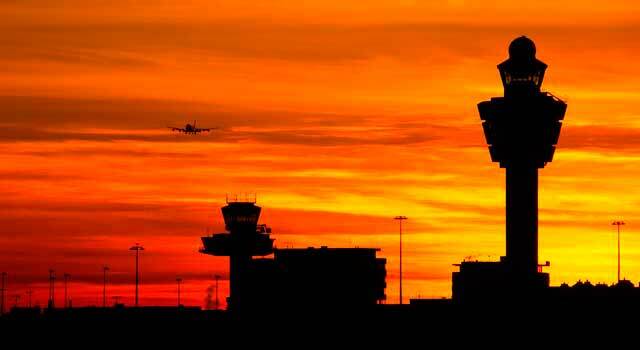 In 2017, 68.5 million passengers passed through the airport, being the 11th busiest world Airport, also being the third busiest airport in Europe. 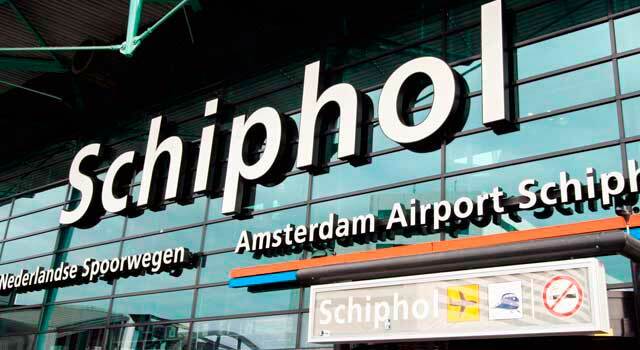 Amsterdam Airport is not the single airport in Netherlands, some low cost carriers moved their flights from Amsterdam Airport Schiphol to other near airports, such as Eindhoven Airport, Rotterdam Airport or The Hague Airport. The movement of this flights was done due the high taxes. Many low cost carriers (like EasyJet) continue to operate from Schiphol, using the low-cost H-pier. The main building of Amsterdam Airport was finished in 1994 and expanded in 2007. There are plans for further airport expansion (2017-2023), featuring a new Pier in Departure Hall 1. The airport also has 5 main runways and landing, plus one that is used for general aviation. Under Schiphol Amsterdam Airport is a fully underground rail station with a train service that operates 24 hours a day at the center of Amsterdam. It has a single main passenger terminal with 6 concourses: B, C, D, E, F, G, H and M.
Amsterdam Airport operates with international and domestic flights. - Ground Level: Arrivals, Ground Transportation. - Second Level: Check-in and Departures. - Third Level: It has VIP Lounges from 1 to 4 and airlines Lounges. It also has access to gates D, E and F.
The train station is just below the passenger terminal. It is planned to built a new terminal building during the next years to have the capacity to handle 14M passengers. It’s planned to be completed by 2023. There are several services, shops and facilities before and after the passport control at Amsterdam Airport. Some of the products that are sell in the airport are: Watches and Jewelry, Fashion and Accessories, Liquor and Delicacies, Perfumes and Cosmetics, Electronics Gifts and Souvenirs Travel items. Restaurants and cafés are also located before and after the security control. The airport also has the Holland Casino, and various hotels. To get more information about the services at the airport, click here. Several companies offer car rental service at the airport. Click here to get more information! 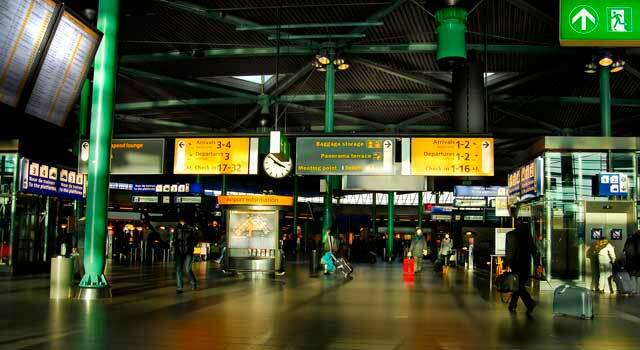 - Train: Schiphol Station is located directly below the airport. Trains run directly to Amsterdam Station as well as other localities, they run every 10-15 minutes. Night trains run every hour and reach other cities also. The Intercity direct train connects Amsterdam Airport City Centre Train with Amsterdam CS, Rotterdam CS and Breda. More info. - Bus: Several buses run to the vicinities of Amsterdam airport every 30 minutes. One-way ticket costs around € 5.00. More info. - Taxi: It is more expensive than public transportation (about € 45.00 - € 50.00). Travel time from Amsterdam Airport to Amsterdam city center is about 25 minutes. More info. Visit the Transportation page online. Schiphol is the hub for KLM (and its regional affiliate KLM Cityhopper) as well as for Martinair, Corendon Dutch Airlines, Cargo, Transavia and TUI Airlines Netherlands. The airport also serves as a European hub for Jet Airways, Delta Air Lines and as a base for EasyJet and Vueling. Passengers can call 0900 0141 (EUR 0.40/ min). Passengers calling from a foreign country, dial +31 (0)20 794 08 00.